In the north of Baja California where grape vines are tended along the Ruta de Vino, population pressure is making water even more valuable. I see that vintners are making the desert bloom with wine grapes, but where is their water coming from? Location: in a desert canyon on the Rio Guadalupe, near a waterfall and natural hot springs, where a nice old man lets people camp. Conditions: starry night and calm, save for a Mexican family sitting around a bonfire laughing in the distance. Discussion: Instead of going directly to Ensenada along the coast, we veered inland and went upriver, to the main wine and olive growing region in Baja: the Valle de Guadalupe. The valley has the rocky appearance of a desert, which makes the vineyards sprouting along the Ruta de Vino (the Wine Route) seem like a string of oasis. I wondered, where does the water come from? Mr. Dalgoff, seen at right, is part of a Russian colony of 100 families that migrated to Baja in 1906 to find a place to live in peace. 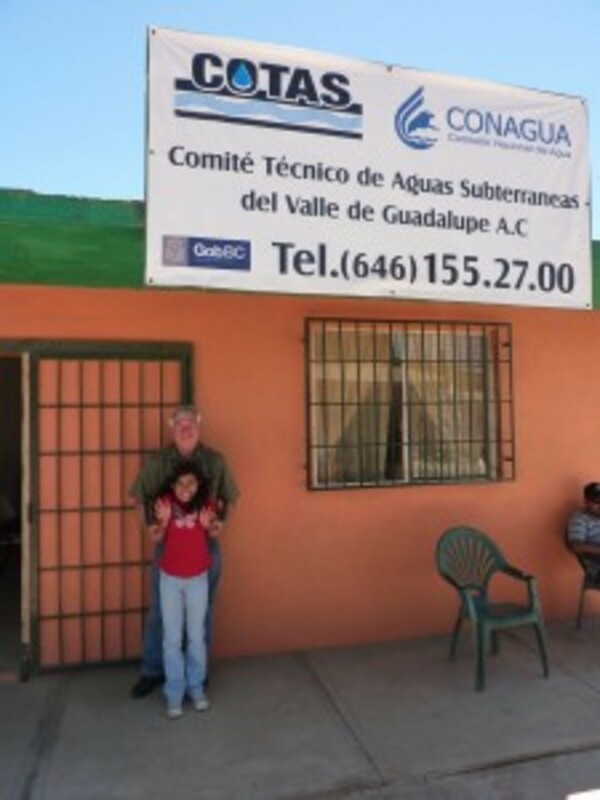 He is also the president of the local COTAS (for Comité Técnico de Aguas Subterráneas, or Technical Commission for Underground Water), a group of community members that provide input to the federal-run water bureau. “With COTAS, we are installing sensors to monitor water level in a number of new wells,” Mr. Dalgoff continued. 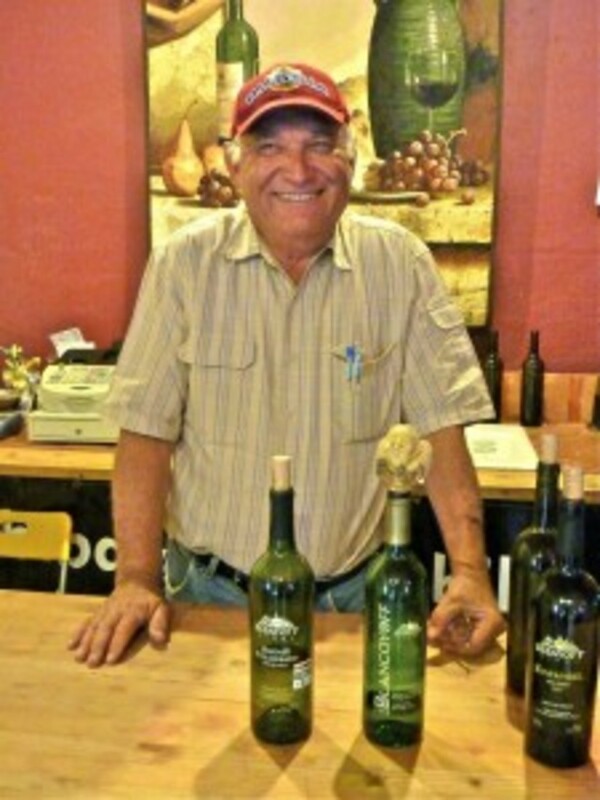 “We want evidence that more water needs to stay in the valley.” As the Bibayoff Winery grew, and water levels in the valley dropped, they adopted new techniques – harvesting water in a rain reservoir, and dry cropping a few grape varieties, like the zinfandel. Dry cropping means that vines receive water only from rain; there is no irrigation. Our destination was the COTAS office – I wanted to learn about the well sensors that we had heard of. Julian Garcia, the head at the office (that&apos;s him and his daughter at left), showed us data from 1977 to present of wells throughout the valley, noting the overall pattern of decline despite occasional spikes caused by rainy years. Although every community is supposed to have a local COTAS, my understanding is that not every community has one, since it takes time, initiative, and collaboration. It is refreshing to see the wine industry taking on measures for conservation – dry cropping, participating in community groups like COTAS, and using recycled materials in the processing plant. These were encouraging signs, but as we were to discover later, not everyone in the wine industry is looked upon fondly. As Mr. Dalgoff said, the water situation ‘seems simple’ but people are a problem. If climate also becomes a problem – and rain becomes more sporadic and fickle – the industry may take a tumble. If laborers lose their jobs, where do they go? Overcrowded Mexico City or Tijuana? Or into the United States? The connection between environmental degradation (water scarcity, soil erosion) and illegal immigration seemed like a stretch, particularly when I was stocking my shopping cart at Trader Joe’s before this trip. But when I’m walking through a dusty agricultural town and talking to the local water manager, it becomes more plausible. El Hippo, the water horse, finds a waterfall in the dry and dusty Valle de Guadalupe. Our Kiri blogger asks if a master-planned monstrosity, perhaps with a bit of greenwashing to hide the problems, is better or worse than an unworkable city that arises higgledy-piggledy?